The trailer for Alex Cross has finally arrived. Skeptics will now chime en masse about their fears having been confirmed. That is understandable, to a degree. As thrillers go, it looks like a fairly standard stuff. All the tropes and trappings are clearly in place. It isn’t enough for the villain to simply be psychotic and murderous, he must be eccentrically and/or perfectly so. The character of Michael "The Butcher" Sullivan, played by Matthew Fox, is an MMA fighter with Special Forces training. With that kind of resume, he might as well be a super villain. Mr. Cross has no such attributes. He’s simply an exceptional psychologist/detective. The more I think about, the more I see parallels to one of this summer’s most anticipated releases: The Dark Knight Rises. Think about it: a super detective faces off against a villainous bodybuilder who means to destroy all that he holds dear. Moot observations aside, does Alex Cross look like it’s worth seeing? I suspect many will say no based the presence of Tyler Perry alone. Again, I can understand why. In its opening moments, the trailer almost looks like it could be for one of Perry’s more “respectable” films (IE the ones not featuring Madea). Things change a bit after the halfway mark, when Mr. Perry suddenly goes all Johnny Rambo. He’s shown sawing the barrel off of a pump action shotgun and stockpiling various weapons in preparation for battle. He then utters a line that that seals the deal for me: “I will meet his soul at the gates of Hell before I let him take a person that I love from me.” Yes, it’s cheesy. Yes, it’s cliché. Yes, I still like it. I’ve never had much of a problem with Tyler as an actor. As long as he’s not wearing a dress (Or sitting in the director’s chair, or writing the script), he’s actually quite serviceable. 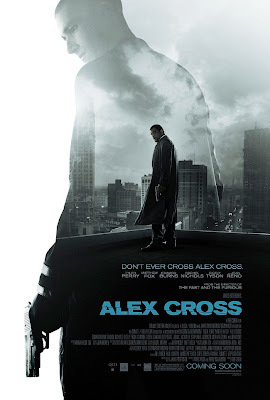 If Alex Cross turns out to be a debacle, it probably won’t be his fault. Well, not all his fault, anyway.